We’re spoiled for choice when it comes to free stock photography these days, but finding good quality free vector art rather than tacky clipart can be a little bit more difficult. Vector graphics can be scaled up or down to whatever size you need without losing quality, making them incredibly flexible. You can use vector art in web design, to create icons, as illustrations to accompany blog posts, to create infographics, and they can be blown up to an appropriate size for print materials such as magazine ads, flyers, and packaging too. 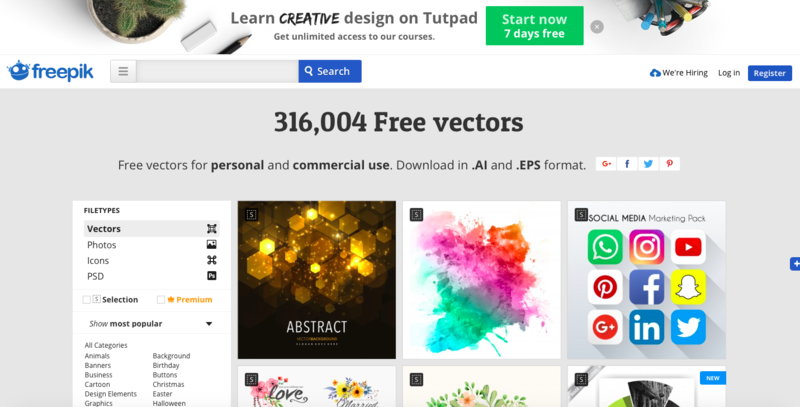 To save you the trouble of scouring the web for vector art, or paying an expensive subscription to access premium vector illustrations, we’ve compiled a list of websites offering high quality vector art for free. Stockio has over 3,000 free vector images available for download and an additional section for icons, some of which are available as vector files too. The collection includes graphics in various styles, patterns, labels, and infographics. There’s simple search functionality to find what you’re looking for. Files are available in various formats (AI/EPS/JPG) and downloads are instant, with no need to sign in or complete a captcha. No attribution is required for use. 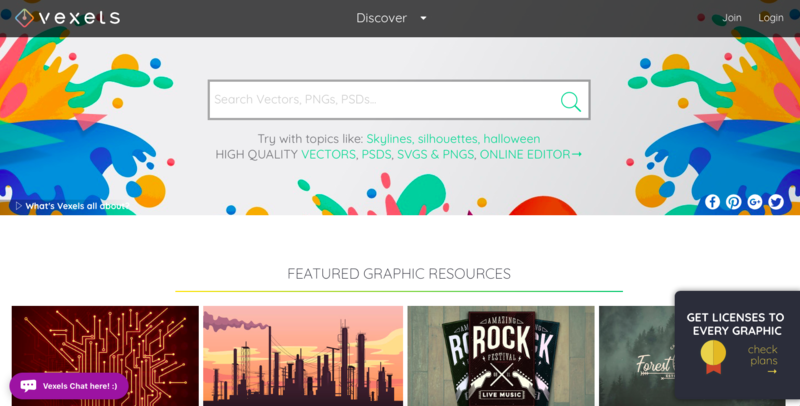 Free vector is a specialist free vector graphics site with over 200,000 files available for download as EPS, AI, PDF & SVG. You can find what you’re looking for either by searching by keyword, or by browsing categories such as 3D, Icon, Animals, Vintage, and Business. You don’t need an account to download images but downloads are delayed by 5 seconds while an ad is displayed. Free images can only be used for personal projects with attribution, but you also have the option to sign up for an account for $9.99 a month to use the premium license on all downloads, which doesn’t require you to credit the image creator, and permits usage for commercial projects. FreeVectors.net has been around for 10 years and aims to make the database as searchable as possible so you can find whatever you need for your project. The keyword search function auto-completes with suggestions as you type, so you can get some new ideas if you’re short of inspiration. Each image has its own creative commons license – most are free for personal use. You don’t need to create an account or login to download images, but all downloads are delayed by 5 seconds while a pop-up ad is displayed. The only major issue with this site is that some of the files are no longer available, though most seem to download with no problem. You also can’t choose a file format to download and don’t know the format of the image you choose until after it’s downloaded. 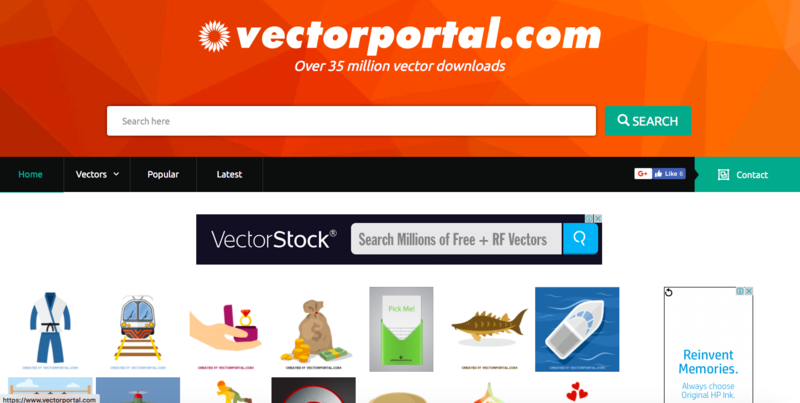 Vector Portal has been around since 2005 and is one of the biggest free vector sites. As well as stock vector images, there is a varied selection of Photoshop and Illustrator brushes, swatches, and styles. You can search for graphics by keyword or browse by category (maps, flags, animals, templates, technology etc.) or see the latest and most popular images. Downloads are instant but open up a new browser tab displaying an advert each time, which can become quite annoying. Most files are in EPS and AI format. Images can be used for commercial projects but attribution is requested if possible and appropriate (i.e. attribution is not required for images printed on a t-shirt). Vector Portal also has a blog with ideas and tutorials for using vector graphics and to create your own vector graphics. 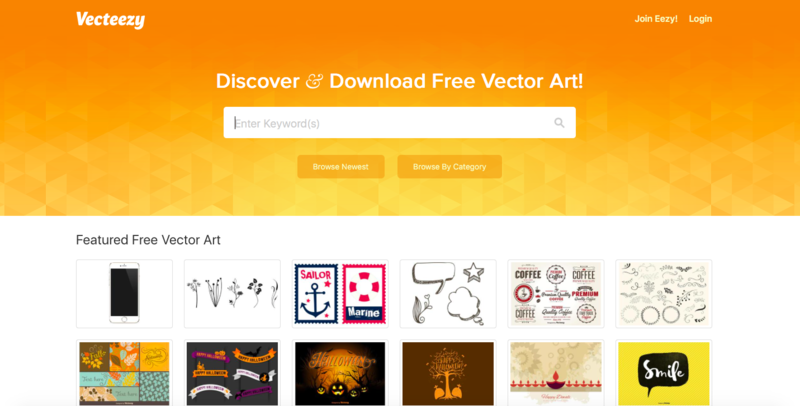 Vecteezy makes it easy to discover and download new vector art with featured downloads sorted into art, icons, and patterns. You can also browse the newest additions to the site, or browse by tiered categories such as “Food > Sushi” or “Holidays > Halloween”. Each file has its own license, with most being free for personal or commercial use with attribution. As well as the free vectors, there’s also a premium selection available only to members. Pricing starts from $14 a month for unlimited downloads and royalty free usage. Membership also gives you premium access to Brusheezy and Videezy. Membership isn’t needed to download free files but it enables faster downloads (downloads when you’re not logged in are delayed by 5 seconds), and gives you the ability to leave comments and save your favorite files for easy access later. The most unique feature of Vecteezy is the online editor that enables you to edit and customize images by changing colors, fonts, and sizes before you download them. Dry Icons is a free vector site specializing in icons, but it also has other vector illustrations and artwork, with over 6,700 files in total. Graphics used for personal or commercial projects must include an attribution and have a link back to the Dry Icons website. Icons and graphics are listed in sets, with the newest uploads displayed on the homepage. You can search for a keyword to get matching results, and also other related keyword recommendations (searching for “cat” gives you quick links to the searches for “dog”, “kitten”, “animals”, and “pets” among others. Downloads are delayed by 3 seconds and come as a variety of formats – you won’t know what file format you’re getting until the download is complete. One thing to be aware of with this website is that Shutterstock images are mixed in with the search results and it’s not very clear that they’re not part of the main search results, which is a little annoying. Vexels has some really high quality artwork on offer, but PSDs and PNGs are mixed in with the vector files in search results so you’ll need to double-check you’re downloading an actual vector graphic if that’s what you need. Luckily the search thumbnails are really easy to navigate with a pop-up showing the file format when you hover over them. Most of images are free to download but you must credit the author and you can’t use them on merchandise, templates, or apps. If you pay for an extended license, starting at $7.49 a month, you have access to more graphics and don’t have to provide an attribution. You can also use licensed images wherever you want. You can also buy a license for a single image for $5. Paid users also have access to an online editor with ready-made designs to customize including greetings cards, website graphics, invitations, advertisements, and more. Each download when you’re not signed in as a premium user creates a pop-up showing the different plans so you have to click twice to download and this slows things down a little. Free downloads are also delayed by 10 seconds. If you’re looking for vector graphics to use as icons, it’s well worth taking a look at Flat Icon. The site contains over 10,000 icon packs and the majority of them are free to download. Premium users (starting from $7.50 a month) have access to more icons and can use them without attribution. The icons are well organized and you can browse by category and filter results for color or black and white icons only, as well as the main search functionality. Flat Icon allows you to create “collections” and add individual icons to your collection instead of downloading the entire set. You have the choice of PNG, SVG, EPS, and PSD formats when you download. Downloads are only active for logged in users, so you must register even for a free account. Once you’re logged in downloads are instant, although there is a pop-up prompting you to sign up for a premium account. 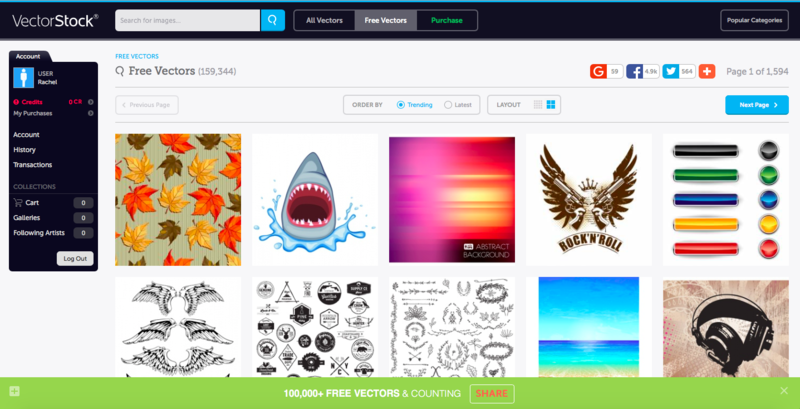 Freepik is a huge resource for free vectors, with over 300,000 images in AI and EPS format available for download. They also list photos, icons, and PSD files. You can browse images by category or search by keyword. Vectors are free for personal or commercial use, but you must credit Freepik unless you sign up for premium membership at $7.50 a month. Premium users also have access to more graphics. 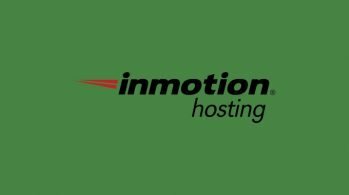 Unregistered users are limited to 5 downloads a day, whereas logged-in registered users have a quota of 30 each day, and premium users can download up to 100. Downloads are interrupted with a pop-up (that you can turn off after seeing it for the first time) but are otherwise instant, after a page redirect reminding you to credit the author. 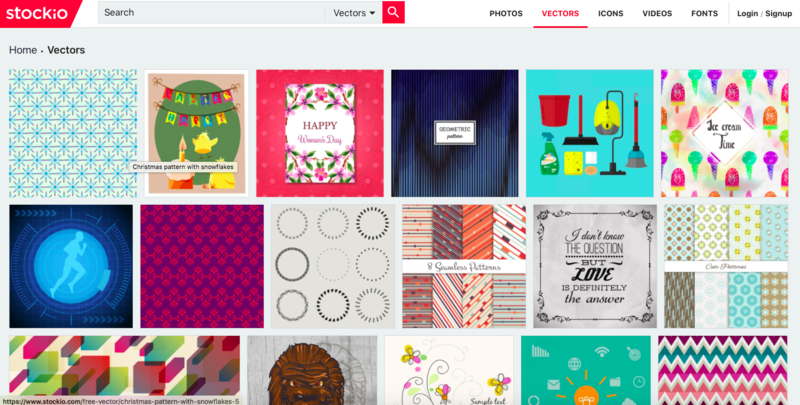 VectorStock operates mainly as a paid marketplace for vector images, but they also have over 150,000 images for free download. The search functionality allows you to search for free vectors only and if you see something you like, you can click the “view similar images” link to see some other options. 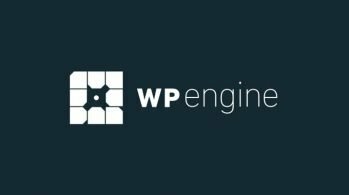 You have the choice of which file format you download (AI, EPS, PDF, or JPG), and the option to upgrade to a paid license, which allows for commercial use and use in website designs. Signup is required before you can download any files. Once you’re signed in, downloads are instant with no pop-ups or delay, and you also have the option to download directly to Dropbox, which can be handy if you’re using a limited or slow connection. With the selection of free vectors offered by the sites discussed, you should be able to find whatever you’re looking for. If you regularly need to download graphics, it’s worth thinking about paying for one of the premium accounts as it’s a lot more convenient and will save you time in the long run. If we’ve missed any of your favorite resources for downloading free vector graphics, please share them in the comments.